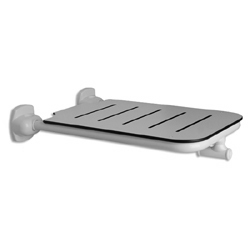 ADA compliant bathtub folding seat manufactured with heavy duty coated frame, available in 5 colors. ADA compliant bathtub folding seat manufactured with heavy duty coated frame and phenolic platform, available in 2 sizes and 5 frame colors. Installed to wall, rests on outer tub wall. Choose size: Installed to wall, rests on outer tub wall. Please call for available lead time. The Adaptive Living Store can not cancel, return or refund custom order items.